For the last 37 years, an orca named Kiska has been living in a narrow concrete pool at Marineland in Ontario, Canada, far from the open waters of the Northern Atlantic where she was captured as a calf. Throughout most of her life in captivity, she was made to perform in front of crowds and to produce offspring, five in all, but each of whom failed to survive long into maturity. She's had numerous companions with which to share her existence, though over decades they have all departed, either through transfers to other marine parks, like Seaworld, or in death. Today, Kiska is alone, prompting some to call her the "world's loneliest orca". She no longer performs, but is still one of the park's headline attractions. At around age 40, Kiska is by no means a young killer whale, but she's far from exceeding the lifespan seen in her counterparts in the wild -- though one might not guess that from looking at her. Killer whale advocacy groups, like Orca United and Ontario Captivity Animal Watch (OCAW) have raised the alarm that Kiska's body is showing serious signs of failing health. She was alone in a small tank and swam in endless circles for the entire hour I was talking to her trainer. Occasionally, she is let out into another adjacent tank where she is fed and can be viewed underwater. After 20 minutes she is called back to her original tank which has no shade or overhang. I watched her eat dead fish and gelatin, and she had no teeth. Kiska's caregivers say that the whale is "quite elderly," but assured that vets work round the clock to make sure she was "comfortable, calm and carefree." 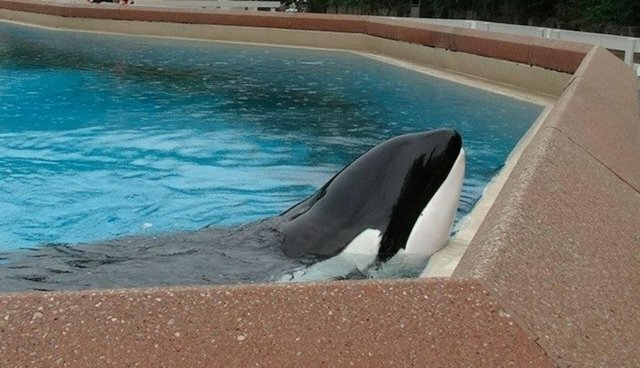 While there's no doubt that Marineland staff would prefer to keep Kiska in good health, her condition in captivity appears to be rapidly deteriorating regardless. Last weekend, OCAW visited the park and took photographs showing that Kiska may be ailing. 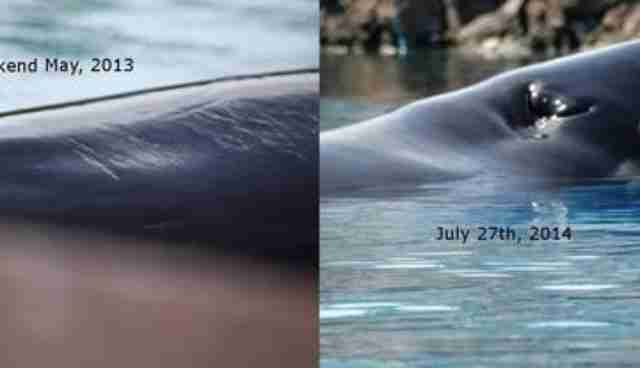 In addition to having severely worn teeth, her dorsal fin appears to be deteriorating and an indentation near her blowhole suggests that she may not be eating properly. Kiska looks underweight in these photos. 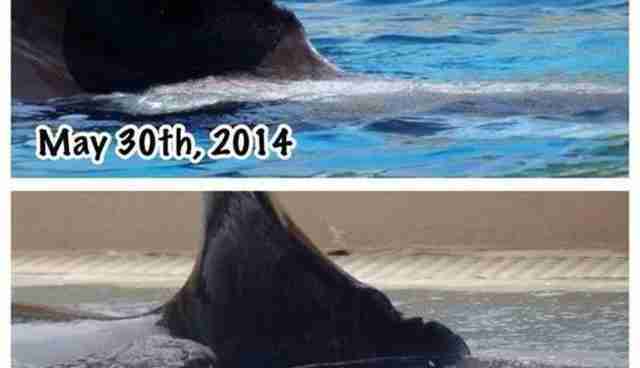 Her fin seems to have some kind of progressive condition – an infection that is causing the tissue to lose its integrity (I am not a veterinarian, but it looks gangrene-like to me). She is NOT in good condition. "We feel that Marineland is in violation of the OSPCA Act Standards Of Care and we are asking WHY Kiska is not receiving help from the OSPCA. We feel that without an immediate removal to a sea pen or even another captive facility which can better facilitate her, she will die alone, in a concrete tank." Protests urging government action are also being planned to accompany the petition, found here, though some fear time may be running out. "Sadly, it appears Kiska's decline and inevitable death will be on display for all to see," says former Marineland employee Phil Demers, to the Digital Journal. "I can't think of a less dignified death."